The M67 grenade is a fragmentation hand grenade used by the United States military. The M67 is a replacement for the M26-series grenades used during the Korean and Vietnam Wars, and the older Mk 2 "pineapple" grenade used since World War II. The M67 grenade has a spherical steel body that contains 6.5 ounces of composition B explosive. The M213 fuse is specifically designed for use with the M67 fragmentation grenade. The M67 grenade weighs 14 ounces in total and has a safety clip to prevent the pin on the grenade from being pulled accidentally. The pin prevents the lever, or "spoon" on the grenade from flipping off and arming the fuse on the grenade. The M67 can be thrown 30 to 35 meters by the average male soldier. Its fuse delays detonation between 4 and 5 seconds after the spoon is released. Steel fragments (not to be confused with shrapnel) are provided by the grenade body and produce an injury radius of 15 meters (~45 ft), with a fatality radius of 5 meters (~15 ft), though some fragments can disperse as far out as 250 meters (~820 ft). To utilize an M67 grenade, the user must first adopt the "throwing position"; feet spread apart with the grenade held squarely in the user's abdomen area. 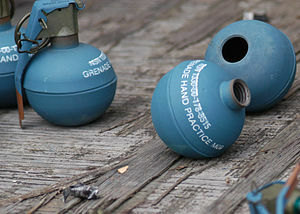 Second, the user removes the safety clip from the grenade. Third, the user places their non-dominant index finger in the pin of the grenade while maintaining a firm grasp on the body of the grenade and safety lever (also referred to as a spoon) with the dominant hand, so in the case the user accidentally pulls the pin, the spoon doesn't automatically fly off and ignite the fuse. As an added safety measure, the pin of a live grenade is bent so it prevents an accidental removal. When the pin is pulled, the user must pull hard enough to straighten the pin as it comes out. The pin is small and made of a relatively soft metal, making it somewhat easy to remove. Left handed people hold the grenade upside down in their left hand. Fourth, the user firmly pulls the grenade away from the pin, ensures that the spoon is still intact, and heaves the grenade at the intended target. The user may also let go of the safety, before throwing, and cook the grenade for a few seconds in order to ensure the enemy does not have time to throw it back before detonation. However, "cooking" a grenade is not recommended in all but the most dire defensive situations, as variances in the length of the delay fuse could cause the grenade to explode too near to the user. The thrower always yells "frag out" to warn others of the outgoing grenade, as simply yelling "grenade" is a warning of an incoming grenade thrown by the enemy. When the grenade is thrown, tossed or dropped, the safety spoon, which is under spring tension but was held in place first by the pin, then by the palm of the user's hand, flies off. This action frees a spring-loaded firing pin which snaps over onto a percussion cap, lighting the time delay fuse which is followed a few seconds later by detonation. The user takes cover from the blast. This is the M67 without the safety clip. It has the same statistics as the M67. This is a variant of the M67 with a backup impact fuse that detonates 3 – 7 seconds after impact. It has the same statistics and markings as the M67 except it has a red-painted fuse and lever to indicate it has an impact fuze. 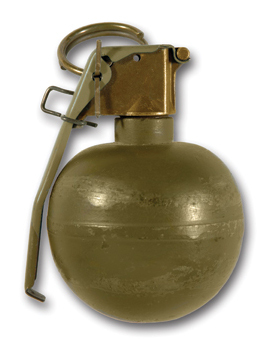 The M69 Grenade is used for grenade training to safely simulate the M67 grenade. The fuse screws into the body, and is replaceable after use. The simulator produces a report and small puff of white smoke when properly employed. The M69 has a blue-painted lever and a blue body. This is to indicate that it is a safe Practice grenade rather than a live fragmentation grenade like the M33 or M67. United States: Primary fragmentation hand grenade of the United States Armed Forces since the 1960s. Canada: The M67 is used by the Canadian Forces, where it is known as the C13.